I went back and forth on whether or not I should share this, but I just kept coming back to the fact that I wanted to write it down before it all started to disappear with the rest of my brain. That, and I loved reading other people’s birth stories leading up to our big day. I especially loved reading the positive ones - because I wanted to go into the whole ordeal with a strong mindset. That is something I found really important. Those stories helped keep me focused on what a miracle it all really is instead of how scary it could be. I will preface this by saying - EVERY birth story is amazing. 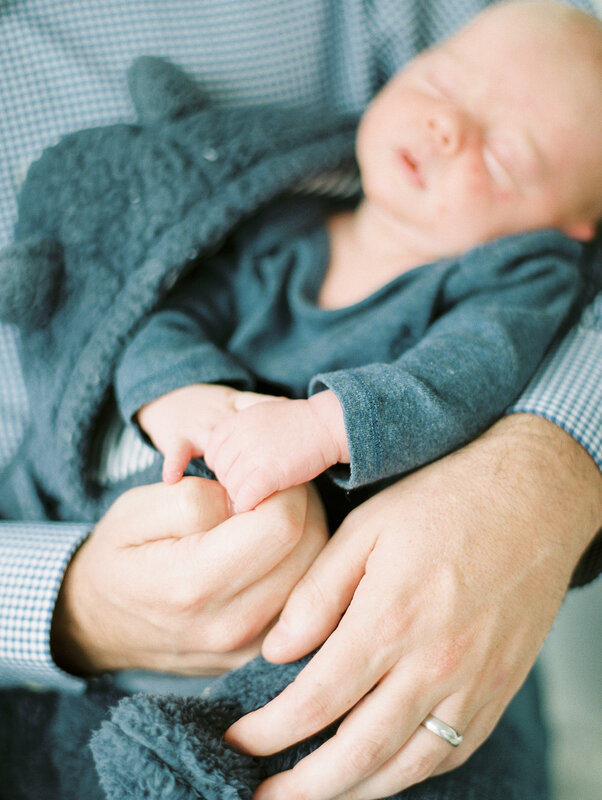 If literally everything went “wrong” in your eyes, but you got to hold your little one at the end - that is beautiful. It’s all so incredibly beautiful. Which is why I wanted to share. Our birth story actually starts about a month or so before Henry was born, when I decided to switch OBs. I was 34 weeks, so it might sound a bit crazy (mostly when I really got along with my doctor), but the more I educated myself on what I wanted (and more importantly what I didn’t want), I knew I needed to make a change. It was around this time Andrew and I took a birthing class with the amazing woman who became our birth doula - Rachelle Friesen. We took the birthing class one Saturday joking about how we were glad it was raining so we didn’t have to waste a beach day, and walked out of there with our eyes wide open to options we didn’t even know we had. Before that we kind of just went along with what people told us to do - we never considered that we really had a say. And then that changed. You know how some people are terrified of snakes or bears or sharks? I have that same reaction to C-Sections. For some reason I can’t even explain, they have always scared me beyond belief. Some people love them because they are planned and scheduled - and since I’m so type A, you would think that would sound appealing to me. But just writing this out makes me anxious. So I knew I wanted to do everything I could to avoid one if I could. After some digging I realized my old OB was very pro c-section and didn’t really love working with doulas - he wasn’t totally against it, he just didn’t seem to love the idea. When I discovered this, I just knew in my gut I needed to be proactive about my experience. For once in my life, I was going to be selfish instead of worrying about someone else’s feelings. Of all times in my life - this was the time to put myself first. My new OB, introduced to me our birth doula Rachelle, liked things to progress as naturally as possible and LOVED working with doulas. Both are amazing doctors, I just realized that I wanted the latter over the former when I really dug deep. This one decision changed so much about my experience. I can’t even imagine my story now without the amazing Dr. McCleary there to hug me through it (she literally hugged me through labor). I owe her so much. I started laboring the afternoon of Henry’s actual due date. That’s how I knew this baby was mine. Overly punctual. We had an ultrasound that morning because I was measuring small (another stress my entire pregnancy) so we got to see his little face (and the assurance that he was totally fine and a good size), but little did we know we’d be back in the hospital that evening to meet him. By 1pm the little cramps that had been plaguing me over the past few weeks weren’t so little anymore. I tried to power through them because I had a massage scheduled for 2pm (and momma wanted that massage), but by 1:45pm I knew these weren’t just normal cramps. It was around this time the dogs started acting really funny - Clemmie was basically kissing me non stop and Otto was trying to lay on top of me. They were trying their best to let me know the day was here. I couldn’t really believe it. If it weren’t for the dogs behavior, I don’t think I would have let myself believe it - besides the intense pain of course. Small detail. Before going into labor, I was so worried that I wouldn’t know when it was actually happening, but well, you KNOW. One of the best decisions we made prior to this day was deciding to work with a birth doula. We had an amazing postpartum doula lined up to help with the first few weeks home (I highly recommend this too, by the way, she was crucial in answering all the questions you have as first time parents - particularly if breastfeeding), but it wasn’t until that birthing class that we realized having someone in the hospital increased our chances for having the kind of labor we wanted. Mind you, all I wanted was to get his baby out as healthy as possible and to avoid a c-section if we could. I realized having someone to advocate for me (for us, really) was really important to me. Her importance was made really clear the moment she met us at the doors of the hospital that day. We were two, excited, somewhat scared, best friends embarking on what we knew was a really important thing - yet had no idea how to go about it. That’s when she literally took the reins and made us feel at ease. She got us into triage, explained everything, laughed at our jokes, and even took pictures for us. I was around 5cm when I got to the hospital, and it was around that time that I made the decision in my head I wanted to get Henry out naturally. No epidural. I just didn’t want to delay meeting him. And let me tell you, it must have been an out of body decision - because whoa, that pain is no joke. Meanwhile, Rachelle got us a room with a shower to labor in, and she showed Andrew my pressure points to help me through the big contractions. We were doing this! We were really doing this. The rest of the evening is so clear in my mind, yet also a blur - if that makes sense. It’s a blur of my husband being so amazing. A blur of me realizing how lucky I am to do this with him. A blur of the most intense pain I could ever imagine. A blur of noises coming out of me that I didn’t even recognize. A blur of amazing energy from our nurses, our doula and OB. A blur of prayers to God that he could give me the strength I needed to bring Henry into this world. It was a blur of me digging deeper than I could have ever imagined - channeling all the women from centuries and centuries who have done this before me - my mom in particular, who gave birth to all four of her babies naturally. It was in these moments I felt so incredibly proud to be a woman. What we can do is so freaking incredible. I focused on that instead of the pain. I labored everywhere I could possible labor in our room. We also spent about two hours in the shower - Andrew sopping wet in his work clothes because he didn’t want to leave my side. I have never felt more grateful for him in my entire life. At around 10pm, I had been laboring for quite some time - and it was the first time I mentioned to Andrew I might need an epidural. I was exhausted, and I didn’t know how much more I had in me. I envisioned it like a marathon - I could keep going if I was on mile 20, but not so much if I was at mile 10. Dr. McCleary and Rachelle encouraged me in ways that only a woman could, and whether they knew it or not, they reminded me of my strength. I wanted to meet our Henry - and I didn’t want any delays. So I passed again on the epidural. About two hours later, it was time to push. And that felt like I was giving every last ounce of strength I had left in me. But I clutched Andrew through every second, Dr. McCleary coached me in her sweet voice and Rachelle made me feel like we were such rockstars. It was a true team effort, and after what felt like forever (but was really only an hour or so) - Henry Arthur Capalbo came into this world - 57 minutes past his due date. And our hearts exploded. I will never be able to do this part of the story justice with words. 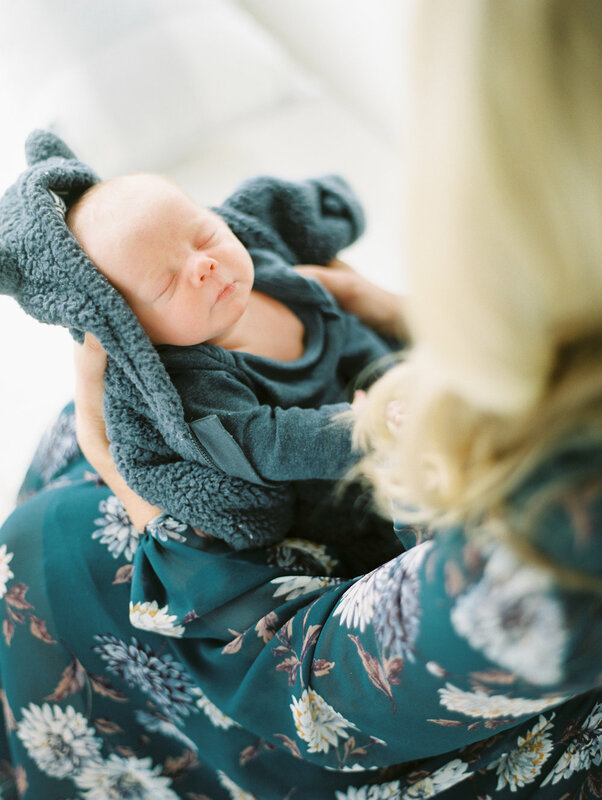 As I reached down to grab this little boy I had been waiting for all my life, I felt a rush of the most intense feelings I've ever experienced. 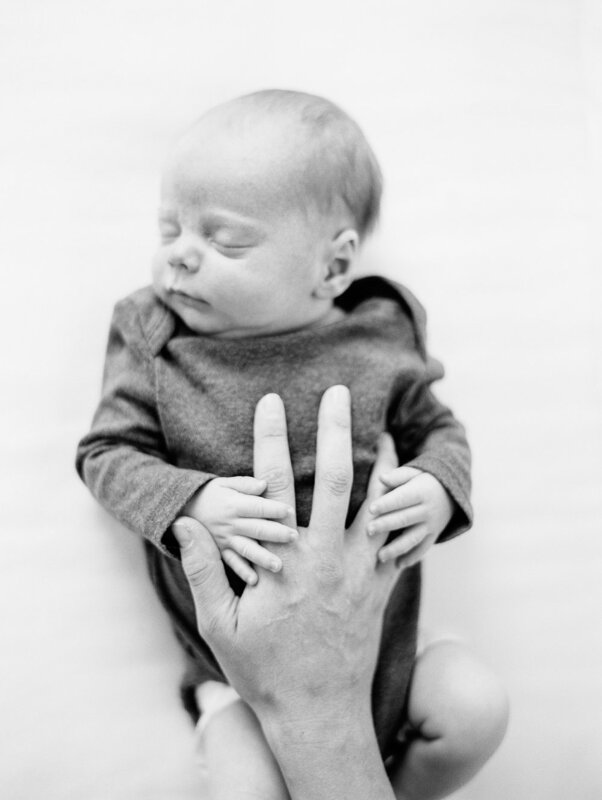 Henry didn’t cry when he was first born, he just crawled up my chest and looked me dead in the eye as if to say, “there you are!” It was such a magical moment. I’m crying just thinking about it. And I’m pretty sure that will be the case for the rest of my life. It was such a beautiful, emotional experience. One I’m so grateful for. It’s easily my proudest accomplishment. I’ve never felt so strong in my entire life. We love you Henry Arthur. More than words will ever be able to express. 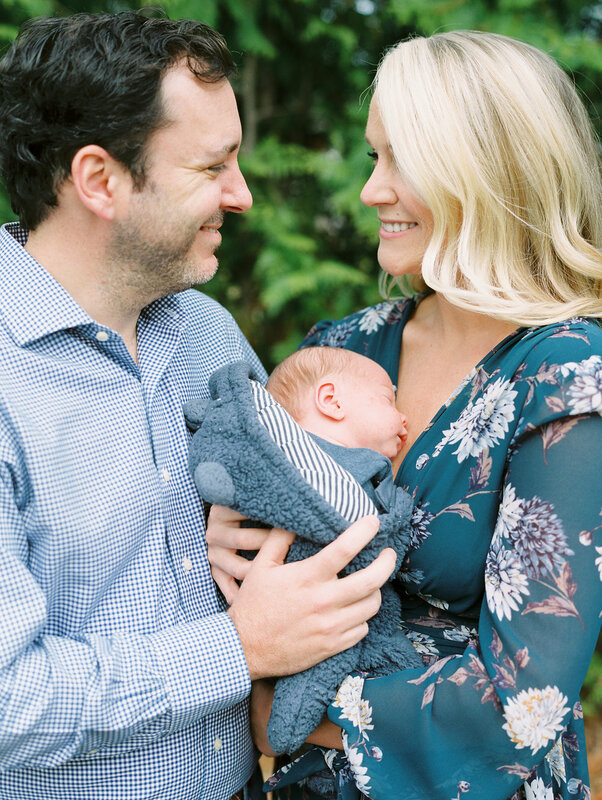 You are the luckiest little boy to be born into our little family - and we plan on spending our lives proving that to you. Welcome to our adventure.